Despite the nonsensical “split decision” narrative peddled by the press on election night, the 2018 midterms were by any measure a blue wave thanks to the historic unpopularity of the sitting President and his initiatives. Nonetheless, Democrats must not forget the sobering reality: the American electoral system is rigged against them. A Republican Party, devoid of any moral backbone, has rigged elections in their favour by gerrymandering every federal and state legislative district they could get their hands on. This has cemented a Republican majority in state legislatures and the House of Representatives ever since, regardless of how many Americans cast their ballots for Democrats. Although Democrats recently won a House majority, they overcame gerrymandering by winning the national House popular vote by a jaw-dropping 8.6 points. Such margins are only seen in once-a-decade wave elections, virtually guaranteeing Republicans a permanent majority until the next round of redistricting if not for a historically unpopular President Trump. Politicians who rely on voter suppression to win are cowards. Naturally of course, the Republican Party does just that. It has passed laws in several states that require a photo ID to vote, intending to suppress voter turnout among minorities that overwhelmingly vote Democratic, and own photo IDs at lower rates. Although Republicans insist they simply seek to curb “voter fraud,” numerous studies confirm that voter fraud is non-existent in the United States. This practice tainted the recent Georgia gubernatorial election, in which hundreds of thousands of voters saw their voter registration canceled or denied by the state’s Republican officials. Republican malfeasance does not stop with election-rigging. Republican legislators are increasingly passing “sore loser” laws. These laws limit the executive power of incoming Democratic Governors and Attorney Generals in Michigan and Wisconsin to nominate judges, appoint pivotal state officials, and pursue litigation. Although some similar efforts by North Carolina Republicans were thwarted by the courts, they have nonetheless put a dent in the power of an executive already severely constrained by gerrymandered Republican majorities. Democrats cannot hope to compete by playing nice with a party that has thrown the basic rulebook of American politics out the window. Intra-party policy battles are a pointless exercise if Democrats are never in the position to make policy in the first place. Moderates will point to the virtues of compromise and bipartisan overtures, ignoring the fact that Republicans have long forgotten the meaning of those words and will continue to simply move the goalposts if necessary. Democrats cannot force a moral awakening in the Republican Party. If governing will henceforth only occur along partisan lines, the time for principled stances is over. In order to win in 2020 and beyond, the Democrats should unite voters behind an inspiring policy platform instead of resorting to the morally questionable tactics of the GOP. Upon taking power, they must “fight dirty” to remove the structural advantages built into the constitution that unfairly favour the GOP, and restore genuine two-party competition. Americans often accept the misguided notion that our constitution and the system it created is sacred and unchangeable. In reality, American government is flawed and should be altered to ensure that the government actually represents the will of the majority of Americans. The future of progressive policy depends on it. The first step is to erode the Republican advantage in the Senate. Currently, the overrepresentation of underpopulated and highly conservative states presents a major roadblock for Democrats. To put this imbalance into perspective, Wyoming’s 600,000 residents receive the same number Senators as California’s 40 million. Each state’s entitlement to two Senators, and the abundance of conservative, sparsely populated states, has limited the amount of Senate seats Democrats can realistically hope to compete for. Even if they manage to win a majority of seats and votes, they will most likely never reach the coveted 60 seat threshold needed to pass legislation. Thus, even if Democrats manage to control the House and Presidency, their agenda will be blocked by a small minority of the population. One proposal to mitigate this glaring problem is to simply add more Democratic Senate seats. Although it will be denounced by Republicans as a radical power grab, it only serves to partially level the playing field – conservative states will still enjoy disproportionate representation. This can be done by splitting large liberal states like California into smaller pieces. In his book “It’s Time to Fight Dirty,” David Faris proposes partitioning California into an ambitious seven states. The passage of Congressional legislation admitting these new states into the union will give Democrats an extra 12 safe Democratic Senate seats. Additionally, Democrats could grant statehood to the District of Columbia and Puerto Rico, which would deliver four more Democratic seats while giving residents the representation they have always deserved. Provided that voters within the given state or territory approve the plan, ratification will fall to Congress. The next time Democrats find themselves in control of the House and Senate, they should make this a top priority. Democrats have long bemoaned the undemocratic nature of the electoral college and its tendency to elect Republican Presidents who lose the popular vote. This system is beyond any kind of reform – it’s time to abolish it. Step two is for Democrats to place the National Popular Vote Interstate Compact (NPVIC) front and centre in its state-level agenda. The NPVIC would render the electoral college obsolete in all but name by requiring any state that joins to award its electoral votes to the winner of the nationwide popular vote for President. This pact will go into effect once the combined electoral vote share of all participating states meets or exceeds the 270 electoral votes needed to win the Presidency, which currently stands at 172 electoral votes. Assuming all blue states join, and Democrats fight tooth and nail to gain control of crucial swing-state governments, the pact will surpass 270. Ensuring that all future Presidents take office by winning the most votes will significantly bolster Democratic prospects. Had this system been in place in 2000 and 2016, Al Gore and Hillary Clinton would have been the 43rd and 45th Presidents of the United States. Fair elections to the Congress and the Presidency are vitally important, but any progressive legislation will inevitably fall under the scrutiny of the conservative Supreme Court. Comprised of a 5-4 Republican majority, the unelected Court has formed a habit of striking down progressive legislation duly enacted by Democrats. In this decade alone, the court bludgeoned the Medicaid expansion under Obamacare and placed millions of poor Americans in a coverage gap, gutted the Voting Rights Act’s protections for minorities, and crippled public sector unions. Due to lifetime tenure, filling a vacancy on the Supreme Court was long regarded as a prize to be won by those Presidents lucky enough to preside over an opening. While this prevented some Presidents like Jimmy Carter from appointing even one Justice, it did not give any political party an outsized advantage. This ended in 2016, when the death of Justice Antonin Scalia was poised to end the Court’s decades-long conservative majority. Senate Republicans took the unprecedented step of denying Obama’s nominee a single hearing, let alone a vote, gambling that Republicans would win the upcoming presidential election. Their gamble paid off. They swiftly confirmed Trump’s conservative pick, Neil Gorsuch, stealing the seat and preserving the court’s Republican majority. The GOP’s conduct has rendered all pre-existing political norms regarding the Supreme Court obsolete. Contrary to the wishy-washy rhetoric about the judiciary transcending politics and ideology, the courts have been politicized for decades now, and the Supreme Court is no exception. With the Republicans ripping up the norms rulebook with no indication of stopping, Democrats ought to follow suit before they are pushed out of power for good. The Republican Party has gone to great lengths to win elections by cheating and fighting dirty. This is exacerbated by the structural advantages afforded to the Republicans by our outdated Constitution. 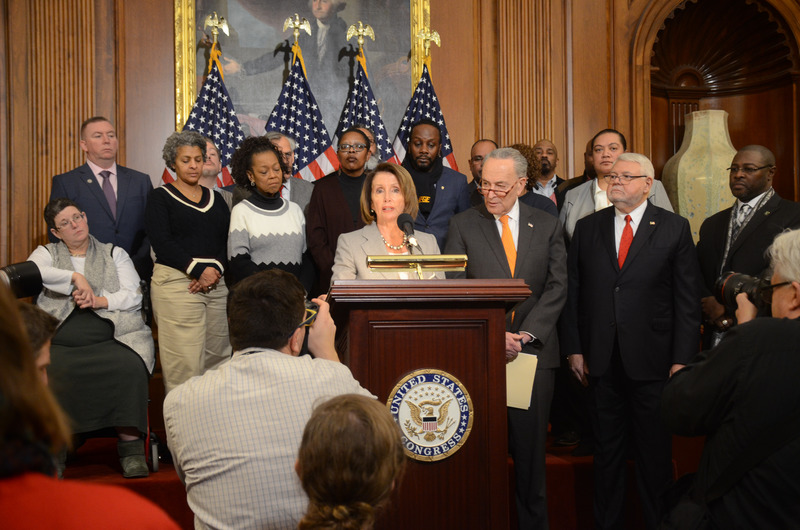 It’s time for the Democrats go to similar lengths to restore the integrity of American democracy and save the country from the reactionary policies of the right. Featured image by AFGE, via Flickr Creative Commons.